The name for "North" when constructing room directions. The name for "South" when constructing room directions. The name for "East" when constructing room directions. The name for "West" when constructing room directions. The prefix placed before the room located above the player. Example: Above you you see the Kitchen. The prefix placed before the room located below the player. Example: Below you you see the Kitchen. The suffix placed after the room located above the player. Example: You see the Kitchen above you. The suffix placed after the room located below the player. Example: You see the Kitchen below you. The prefix placed before the room located adjacent to the player. Example: To the North you see the Kitchen. The suffix placed after the room located adjacent to the player. Example: You see the Kitchen to the North. The keywords the player can use in order to move North. 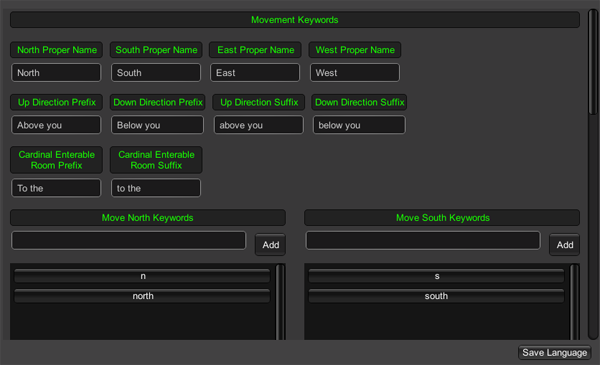 The keywords the player can use in order to move South. 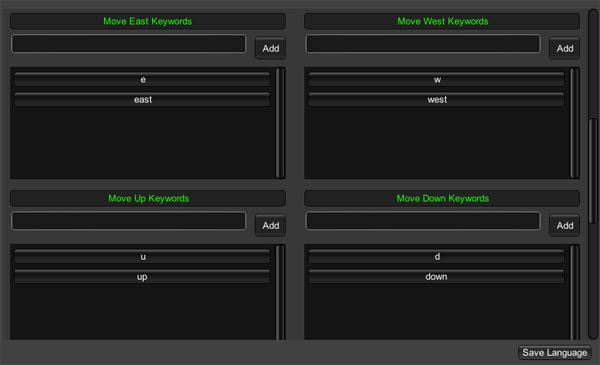 The keywords the player can use in order to move East. 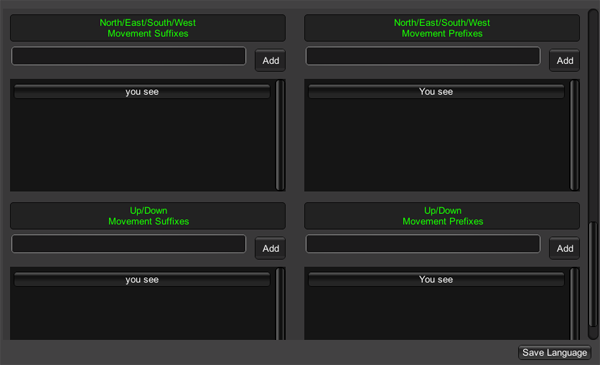 The keywords the player can use in order to move West. The keywords the player can use in order to move Up. The keywords the player can use in order to move Down. The suffix placed after the direction when printing cardinal exits. The prefix placed before the direction when printing cardinal exits. The suffix placed after the direction when printing dimensional exits. Example: Above you you see the Attic. The prefix placed before the direction when printing dimensional exits. Example: You see the basement below you.